Hello, this is a long shot- but I guess I will try. My Great Uncle- Stanislaw Stasiek, was executed during the war by the Nazis in Poland. From what the family has figured out, he was part of the local partisan forces in the country between Krakow and Tarnow but the area where my family is from is under the juridisction of Tarnow. One day he was arrested and some time later he was executed in Tarnow. My great grandmother received a message she could visit his body, but she decided not to. I am looking for any information regarding his legacy and death- mabe someone out there has something on him. Have you tried contacting the Muzeum Armii Krajowej in Krakow? im. Generała Emila Fieldorfa "Nila"
Good luck Artur, be sure to update us as and when you receive more information. Hi Artur, yes - please keep us posted. Best wishes with your research. Artur do you have any idea exactly where? I have looked for a Great Grandfather in law who was also a Partyzan during WW2. I am familiar with a few groups who worked around the area's of Mielec, Kielce, Rzeszów and Świętokrzyskie area and also found out that his wife was possibly taken by the germans to a Gestapo Prison in Tarnów and murdered. If any of these area's are related in any way then there is a book you can buy from the IPN which you can see on this link. Its is about one particular Partyzan unit but it mentions many more. Thank you Carl for the link to the museum- unfortunately, I can only speak Polish. . But I will try to find someone to help me in the family. As to other information, he was from the village of Borzecin ( almso Gmina Borzecin) in Brzesko County located in the Lesser Poland Voivodeship. I heard about his death only from my grandmother ( he was my grandfather's older brother, but grandfather unfortunately passed away over twenty years ago). She barely knows anything about, other than the fact he was executed in Tarnow. She says he was a freedom fighter, but I am not that sure- thats why I want to know why he died through any documents regarding him. Grandmother told me how once an angry brother informed the local German authorities that his older brother had a pistol, but due to the fact he knew of its posseccion for a while- he was arrested and placed in the back of a truck alongside his brother. According to her, they never returned. As many citizens died for such miniscule offences - I just want to know my great uncle just did not die for nothing. 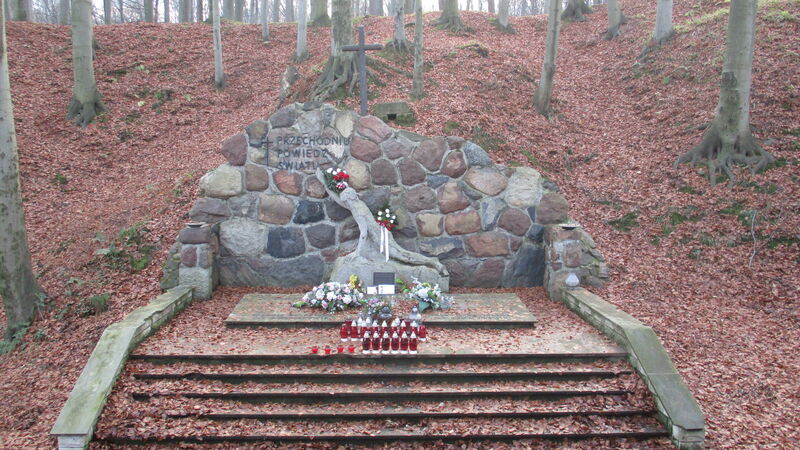 For those that cannot read Polish, Stanislaw was shot in a forest along with another local on April 10, 1941, for participation in the resistance movement. Its difficult to describe how this bit of information made me feel. I have looked for such a long time. My grandmother and I talked a few weeks ago, and Stanislaw was brought up in our conversation. She regrets not having remembered the specifics of what my grandfather said in regards to his brother's death. I plan on sharing this information with her this weekend. More to follow. booklet that I mentioned in the previous post. It turns out that there is a monument on top of the grave site. Most of the victims, if not all, were executed by the Gestapo in Tarnow. I can only imagine that Stanislaw's last days would have been in agony. Hopefully I can pay my respects to him one of these days. « 1st of March Day of the "Cursed " Soldiers.